Engineers and architects discuss the innovative strategies they used to construct the project. The Clark Construction group built the approximately 500,000-square-foot building. The SEH was designed by the Philadelphia-based architecture firm Ballinger. 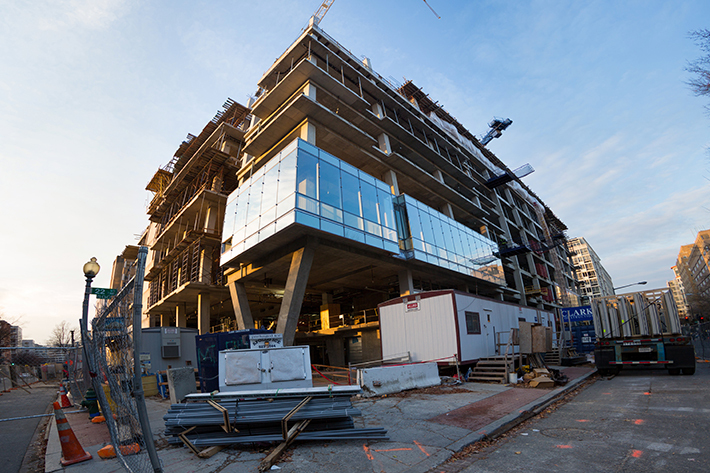 As its opening date approaches, the Science and Engineering Hall is becoming a focal point of the George Washington University’s Foggy Bottom Campus. The approximately 500,000-square-foot building will include ultramodern research facilities, such as a nano-materials fabrication clean room and an imaging suite. And once it opens its doors in 2015, researchers from multiple GW schools will be housed under one roof. “It likely will house the most diverse amount of combined science and engineering of any building that you could find in the United States,” said Rob Voss, an architect at Philadelphia-based Ballinger, the project’s architecture firm. 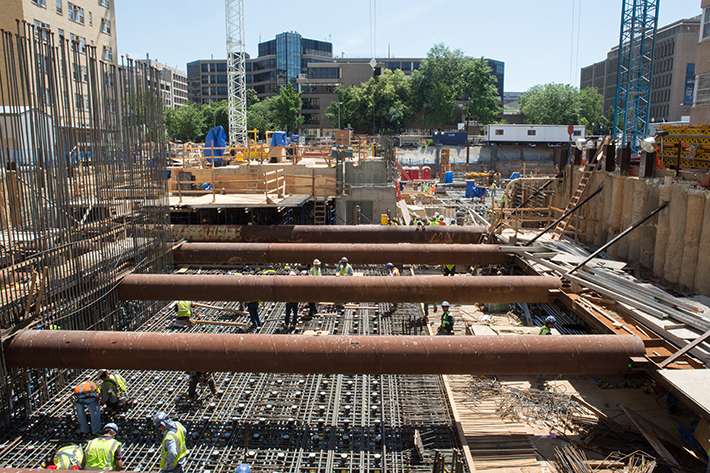 But completing the university’s largest-ever capital construction project in the middle of downtown Washington, D.C., came with a fair share of unique challenges. Mr. Voss and three representatives from the project’s Clark Construction team discussed the challenges they faced during an event in the Elliott School on Thursday, giving students, faculty and alumni a behind-the-scenes look at both the design and construction process. The Clark Engineering Scholars Program sponsored the event. Molly Olsen, B.S. ’14, has been part of the project from the ground up. A former Clark Scholar, she started as an intern for Clark Construction as a sophomore, and she continued on the SEH project after the company hired her as an office engineer in 2014. When the design and construction teams began plans for building SEH, one of their main priorities was to maximize the space of the building. In the basement of Walter G. Ross Hall—located directly across from SEH—is a very large Central Utility Plant, which houses boilers and chillers. The university decided the best way to maximize space in SEH would be to upgrade Ross Hall’s Central Utility Plant and to install a cogeneration system in SEH’s neighbor building. A cogeneration system delivers two forms of energy (electricity plus heat) from a single fuel source. The Clark Construction team worked quietly and efficiently to ensure that Ross Hall could maintain its regular operations while the project was underway. The central utility plant will provide 80 to 85 percent of the energy required to power Ross Hall and SEH. It greatly reduces the new building’s as well as the university’s carbon footprint. The SEH was designed with sustainability in mind. Architects knew that the approximately 500,000-square-foot building would increase the university’s carbon footprint, so they found innovative ways to create a greener building. By utilizing the cogeneration system in Ross Hall, they were able to reduce the SEH carbon footprint by 8,100 metric tons per year—that’s the equivalent of eliminating 1,490 vehicles or planting 1,875 acres of forest. The SEH also includes a high-albedo or “cool” roof that reflects sunlight and saves cooling energy. Chilled beams in the SEH also improve cooling efficiency, as well as energy recovery wheels, which recover energy from the air and push it back throughout the building. A rainwater collection system stores rainwater, which is then used to flush the building’s toilets. The four-floor parking garage, built below the building to maximize space, includes electric car charging stations. Common spaces throughout the building give students and faculty sunny places to study, collaborate and host events. Architects wanted to introduce vegetation into these spaces, but they needed to consider the amount of sunlight available in different areas of SEH. On the south side of the building, a 25-foot ficus tree, already in the building, provides a focal point. In the west end of the common areas, you’ll find Rhapis Palms, and at the north, where there is less natural light, the construction team built a green wall. 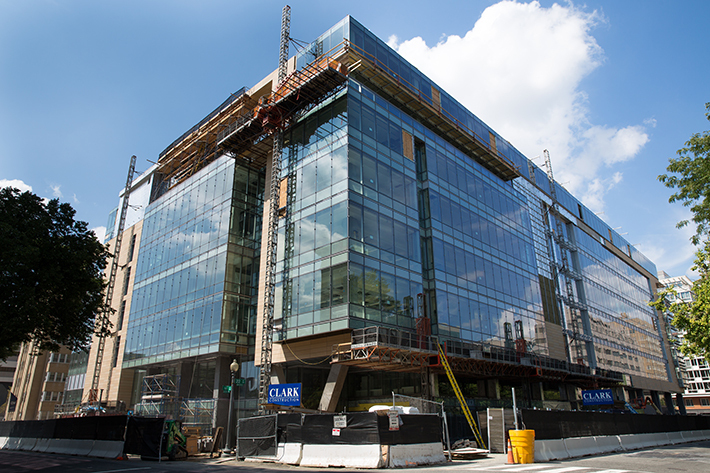 Building a modern teaching and research facility on a busy college campus, in the middle of Washington, D.C., was no simple task. The boundaries of SEH needed to fit inside the oddly shaped former University Parking Garage, and the building could not exceed 110 feet above grade. Many people live and work around this site, and communicating with them was very important to be successful, Mr. Voss said. When building, the Clark Construction team was cognizant of the heavy foot and vehicle traffic around the site. 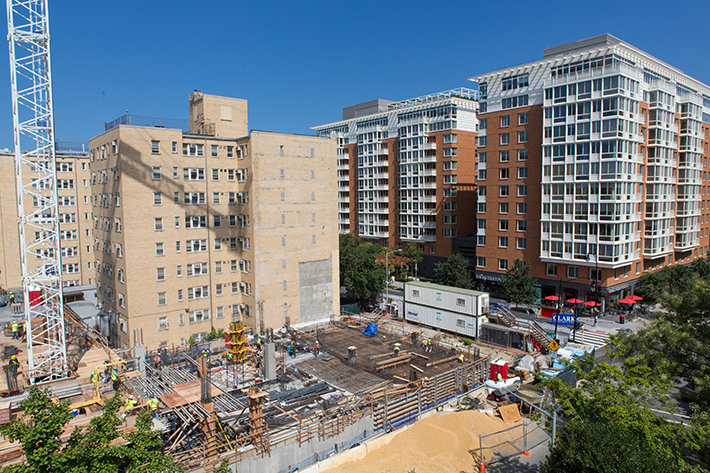 SEH is just feet away from four residence halls, the Foggy Bottom Metro and other neighborhood fixtures. The team took special precautions to ensure that the construction of the building would not disturb the daily lives of the people who live and work in the area. For instance, rather than using a wrecking ball to demolish the University Parking Garage, Clark Construction removed its parts piece by piece and began the exceptionally noisy activities later in the morning. They maintained a regimented “controlled blasting schedule” at the beginning of the project, which entailed stopping I Street vehicular and pedestrian traffic for a few minutes at the same time each day. 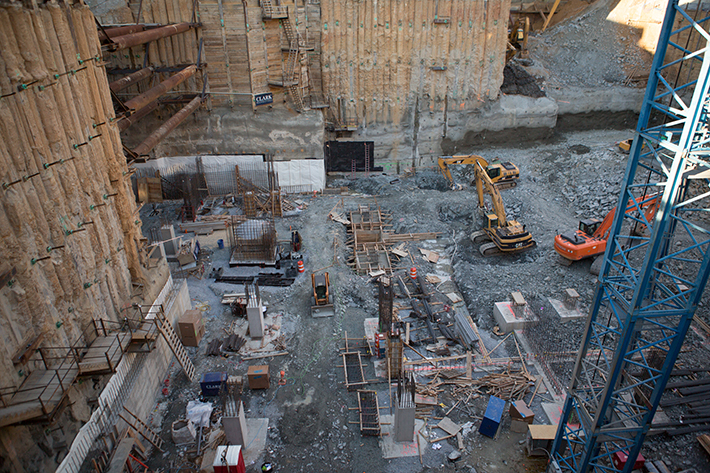 The team also utilized a global monitoring system, which alerted Mr. Naumick via email if there were any notable movements in the foundation around the construction site. 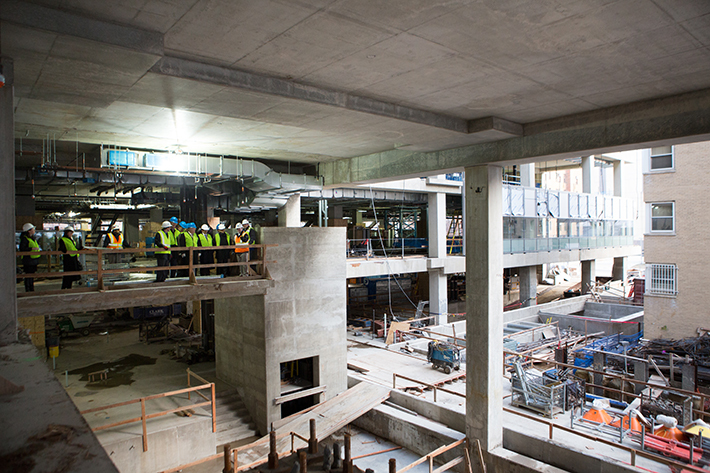 The Science and Engineering Hall's four-year construction process began in 2011. The building was built at the site of the former University Parking Garage. 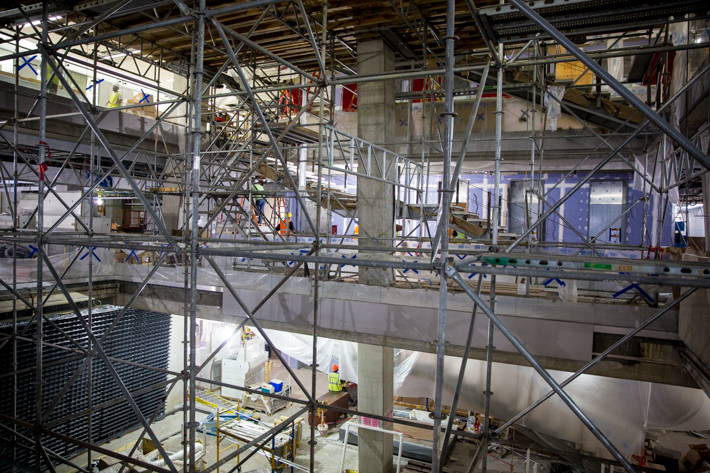 The beginning stages of construction at Science and Engineering Hall. 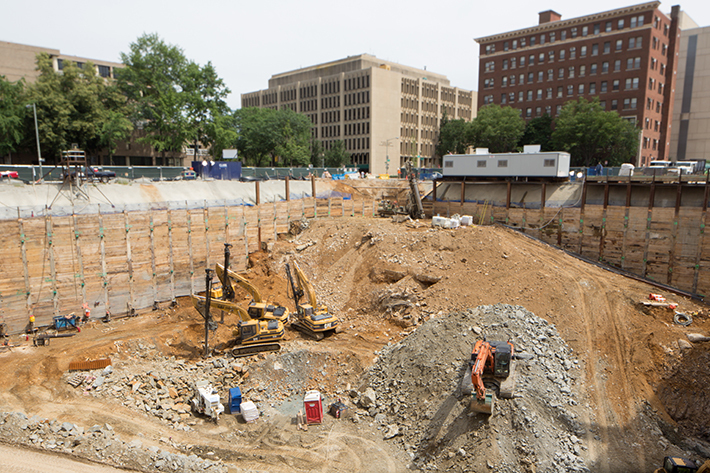 GW's new, state-of-the-art Science and Engineering Hall will be a research and teaching hub in the heart of Washington aimed at fostering collaborations across disciplines and a dynamic, hands-on learning environment. 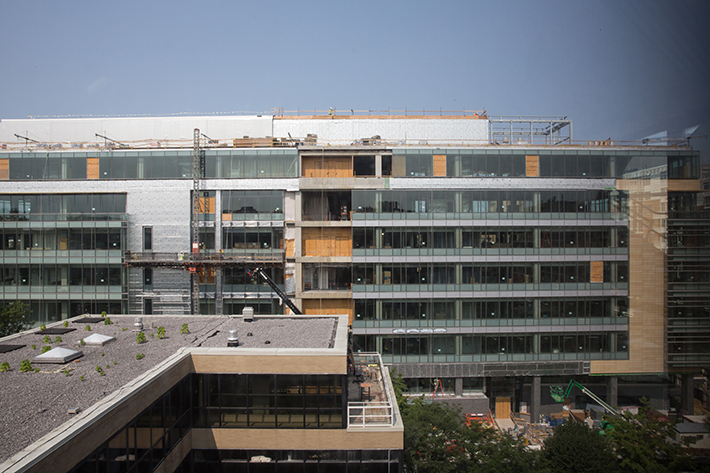 In September 2014, GW announced that some faculty would move into the Science and Engineering Hall by December, in advance of the building’s scheduled opening at the start of the spring 2015 semester. 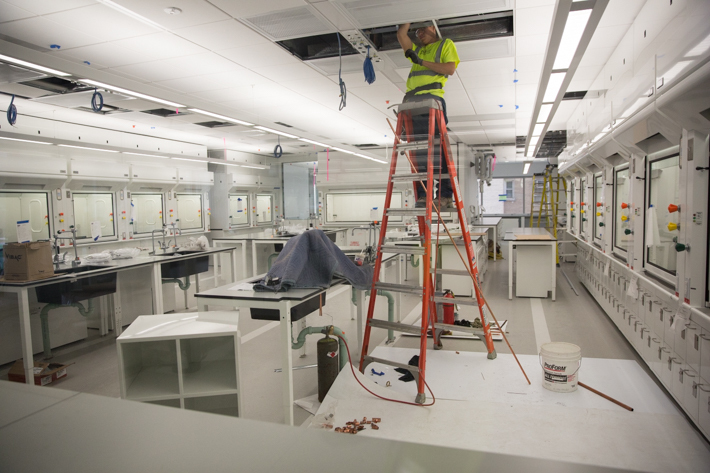 A lab inside the SEH nears completion. The building will include wet and dry laboratories, collaborative teaching areas, lounges an aquatic suite and a greenhouse.